Wedding ceremony packages are a cost-effective way to achieve a beautiful outdoor wedding setting. Adorable Wedding Concepts have been providing wedding ceremony hire services for over 15 years right across the Sydney metro area and sometimes beyond. We’ve established a great insight into what creates a gorgeous setting and we’ve built our ceremony hire packages around our intimate knowledge and understanding of what people most often request for their outdoor wedding decorations. Our wedding ceremony packages range in size to suit all occasions. We’ve incorporated more wedding chairs and aisle decorations in the larger packages to cater for larger venues and more people. Our aisle length varies from 6m to 9m and we boast the widest aisles, 1.5m, available to ensure 2 people more than comfortably fit when walking down the aisle. All of our wedding ceremony package items are custom designed specifically for outdoor wedding ceremonies. This means we’ve designed them to withstand the unpredictable conditions Sydney can be prone to during the peak wedding season. Our items, from our wedding arch, Love Sign, floral aisle decorations and particularly important, wedding aisle, will not be blown away in windy weather. You can be confident that the wedding styling will remain intact no matter the conditions and look exactly the same from setup to pack down. 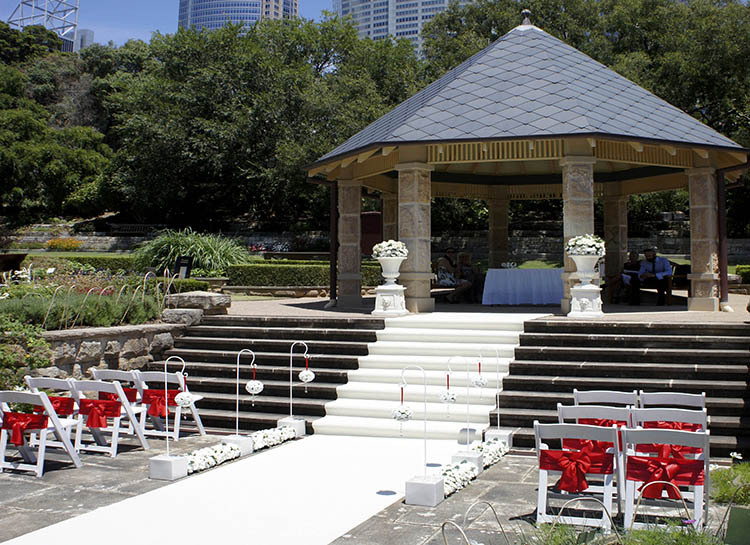 All this is very important when considering an outdoor wedding ceremony package. Adorable Wedding Concepts Princess wedding ceremony package includes a small number of chairs and aisle decorations and is designed for smaller occasions where space may be limited or you simply want to keep your outdoor wedding budget to a minimum. The ceremony styling may be minimal but the ceremony hire package doesn’t look bare. The Elegance wedding ceremony package is a setting that provides a little bit more over the Princess wedding package without a huge increase in the budget. We’ve added items that people have often requested as additions in the past so you receive a great valued ceremony package that suits a range of venues. 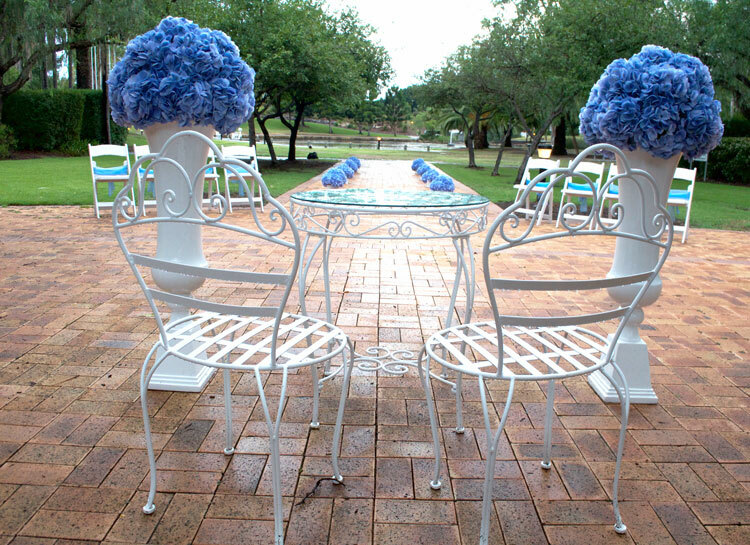 We’ve added wedding chairs, aisle decorations and floral urns and pedestals to the setting. The Eternity wedding ceremony package incorporates a lot of additional items namely our wedding Love Sign letters and wedding ceremony arch. Both items create a beautiful feature to an outdoor ceremony and the Love Sign is hugely popular with photographers for group photos. There are more than enough chairs in this wedding package for pretty much all outdoor ceremony occasions. Adorable Wedding Concepts focus on providing wedding ceremony packages as we believe this provides our brides and grooms with a complete setting which looks stylish and modern at the best possible price. We’re open to adding additional items to our packages and we’re happy to discuss a revised price. Adding a lot of changes or creating something completely unique is a custom wedding ceremony package which we’re very happy to create. We’ll even source or help source particular items you want for your wedding ceremony. We book out fast during the peak season so send your enquiry today to check availability on the date you’re considering.